Download "The Work Injury Benefits Act"
2 2 CAP. 236 Work Injury Benefits [Rev CHAPTER 236 THE WORK INJURY BENEFITS ACT ARRANGEMENT OF SECTIONS Section Part I Preliminary 1 Short title and Commencement. 2 Interpretation. 3 Application. 4 Meaning of employer. 5 Meaning of employee. 6 Meaning of dependant. 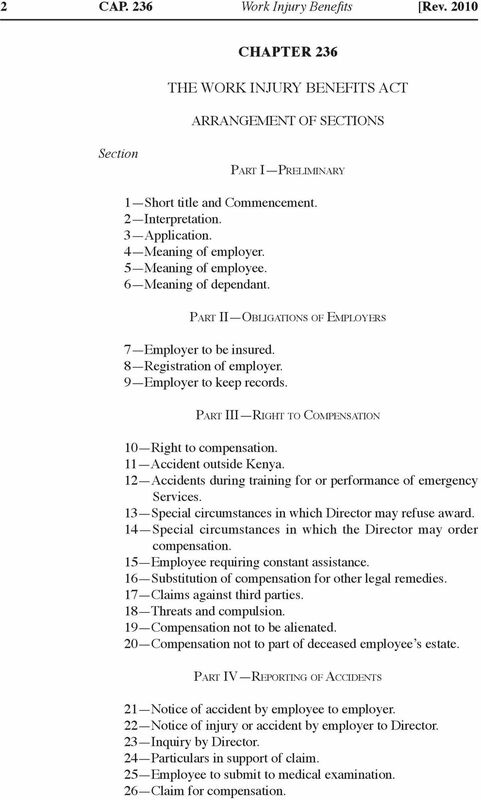 Part II Obligations of Employers 7 Employer to be insured. 8 Registration of employer. 9 Employer to keep records. Part III Right to Compensation 10 Right to compensation. 11 Accident outside Kenya. 12 Accidents during training for or performance of emergency Services. 13 Special circumstances in which Director may refuse award. 14 Special circumstances in which the Director may order compensation. 15 Employee requiring constant assistance. 16 Substitution of compensation for other legal remedies. 17 Claims against third parties. 18 Threats and compulsion. 19 Compensation not to be alienated. 20 Compensation not to part of deceased employee s estate. 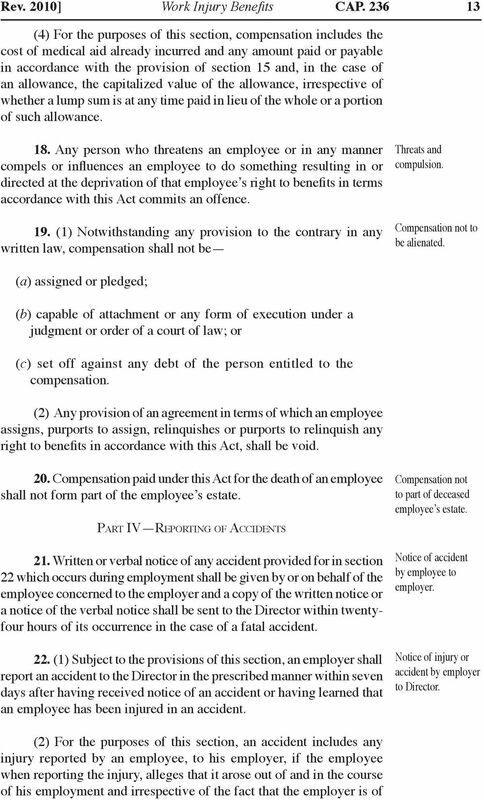 Part IV Reporting of Accidents 21 Notice of accident by employee to employer. 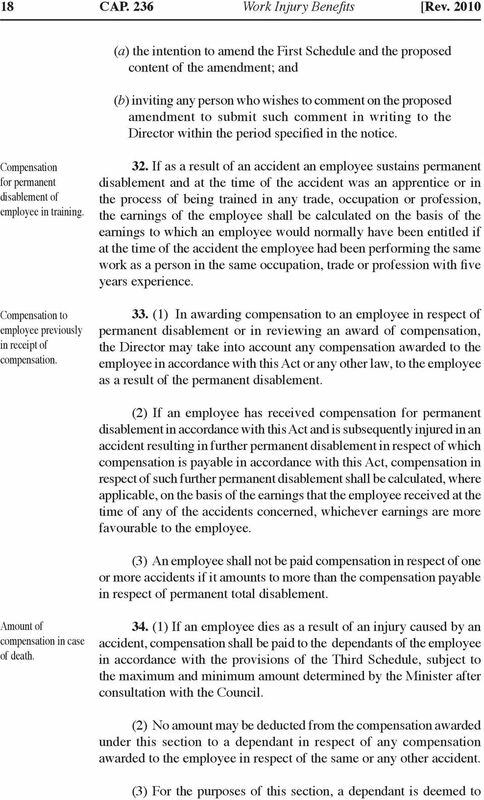 22 Notice of injury or accident by employer to Director. 23 Inquiry by Director. 24 Particulars in support of claim. 25 Employee to submit to medical examination. 26 Claim for compensation. 3 Rev. 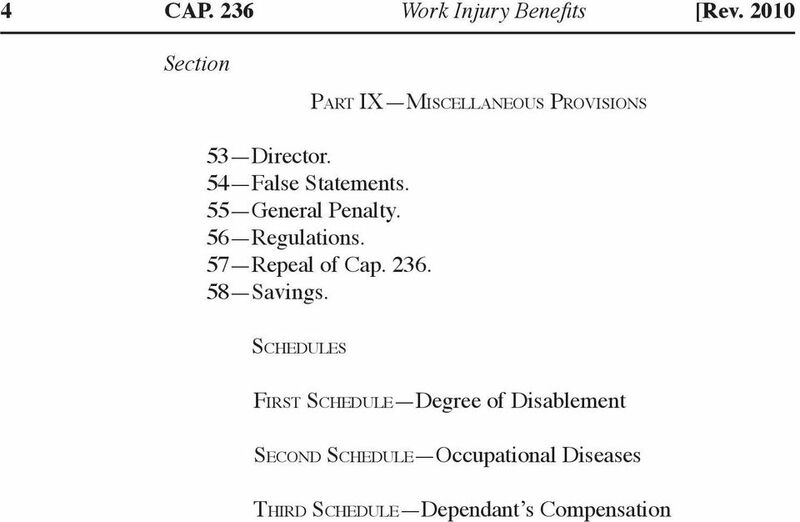 2010] Work Injury Benefits CAP Section 27 Lapse of right to benefits. Part V Compensation 28 Compensation for temporary total or partial disablement. 29 Expiry of compensation for temporary total or partial disablement. 30 Compensation for permanent disablement. 31 Amendment of First Schedule. 32 Compensation for permanent disablement of employee in training. 33 Compensation to employee previously in receipt of compensation. 34 Amount of compensation in case of death. 35 Amendment of Third Schedule. 36 Payment of compensation. 37 Manner of calculating earnings. 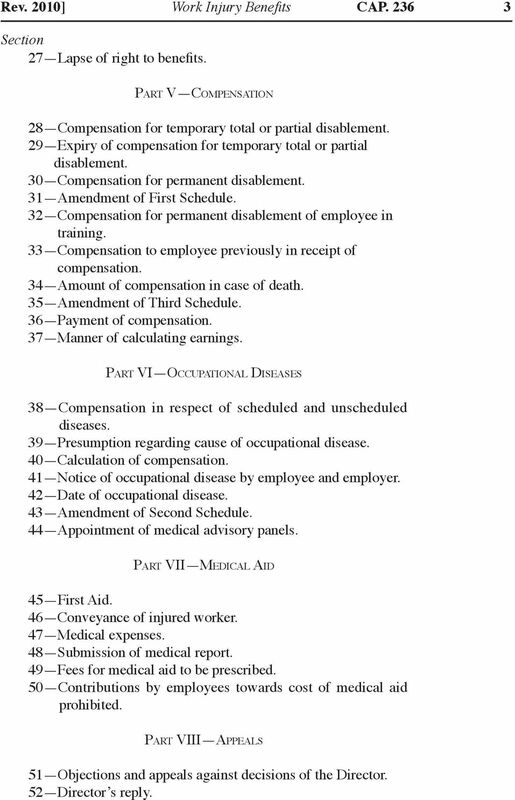 Part VI Occupational Diseases 38 Compensation in respect of scheduled and unscheduled diseases. 39 Presumption regarding cause of occupational disease. 40 Calculation of compensation. 41 Notice of occupational disease by employee and employer. 42 Date of occupational disease. 43 Amendment of Second Schedule. 44 Appointment of medical advisory panels. Part VII Medical Aid 45 First Aid. 46 Conveyance of injured worker. 47 Medical expenses. 48 Submission of medical report. 49 Fees for medical aid to be prescribed. 50 Contributions by employees towards cost of medical aid prohibited. Part VIII Appeals 51 Objections and appeals against decisions of the Director. 52 Director s reply. 12 12 CAP. 236 Work Injury Benefits [Rev Director may order compensation. Employee requiring constant assistance. claim as if the contract was valid at the time of the accident. 15. 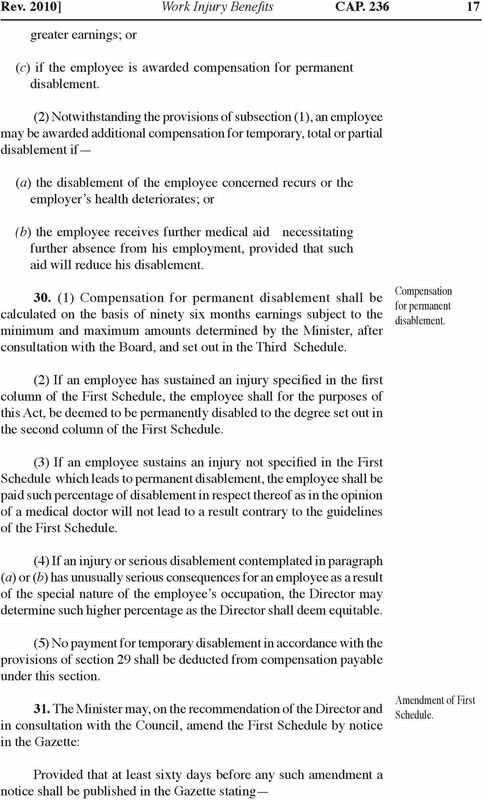 (1) If an injury in respect of which compensation is payable causes disablement of such a nature that the employee is unable to perform the essential functions of life without the constant assistance of another person, the Director shall grant an allowance in addition to any other benefit provided for under this Act, towards the cost of such help as may be required for a specified period, which allowance shall be reviewed from time to time. (2) The Director may, upon the application of the employee and on good cause shown by the applicant, revise any order made in accordance with sub-section (1). Substitution of compensation for other legal remedies. Claims against third parties. 16. 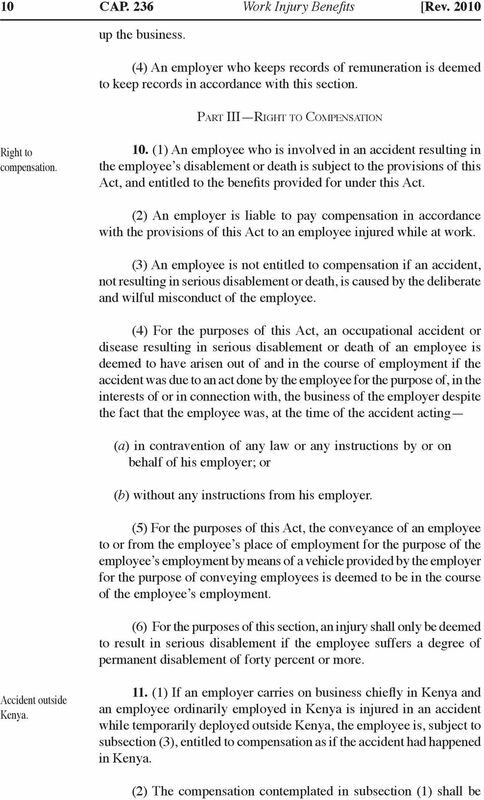 No action shall lie by an employee or any dependant of an employee for the recovery of damages in respect of any occupational accident or disease resulting in the disablement or death of such employee against such employee s employer, and no liability for compensation on the part of such employer shall arise save under the provisions of this Act in respect of such disablement or death. 17. (1) If an occupational accident or disease in respect of which compensation is payable, was caused in circumstances resulting in another person other than the employer concerned (in this section referred to as the third party ) being liable for damages in respect of such accident or disease (a) the employee may claim compensation in accordance with this Act and may also institute action for damages in a court against the third party; and (b) the employer or insurer by whom compensation in respect of that accident or disease is payable may institute action in a court against the third party for the recovery of compensation that the employer or insurer, as the case may be, is obliged to pay under this Act. (2) In awarding damages in an action referred to in subsection (1) (a) the court shall have regard to the compensation paid in accordance with this Act. (3) In an action referred to in subsection (1) (b), the amount recoverable may not exceed the amount of damages, if any, which in the opinion of the court would have been awarded to the employee but for the provisions of this Act. 15 Rev. 2010] Work Injury Benefits CAP is not capable of travelling to be examined by the designated medical practitioner, the employee shall inform the party requiring the examination thereof or cause him to be so informed, and the designated medical practitioner shall then examine the employee at a time and place as agreed upon. (3) An employee shall be entitled at his own expense, to have a medical practitioner of his choice present at an examination by a designated medical practitioner. 26. (1)A claim for compensation in accordance with this Act shall be lodged by or on behalf of the claimant in the prescribed manner within twelve months after the date of the accident or, in the case of death, within twelve months after the date of death. Claim for compensation. (2) If a claim for compensation is not lodged in accordance with subsection (1), the claim for compensation may not be considered under this Act, except where the accident concerned has been reported in accordance with section 21. 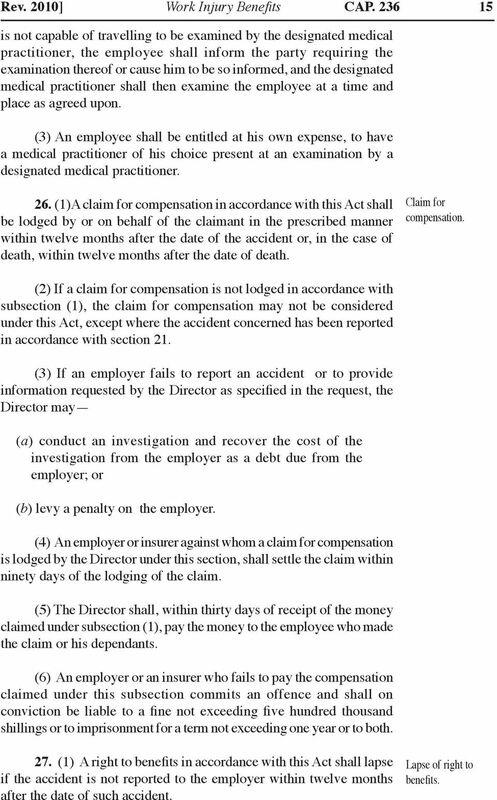 (3) If an employer fails to report an accident or to provide information requested by the Director as specified in the request, the Director may (a) conduct an investigation and recover the cost of the investigation from the employer as a debt due from the employer; or (b) levy a penalty on the employer. (4) An employer or insurer against whom a claim for compensation is lodged by the Director under this section, shall settle the claim within ninety days of the lodging of the claim. (5) The Director shall, within thirty days of receipt of the money claimed under subsection (1), pay the money to the employee who made the claim or his dependants. (6) An employer or an insurer who fails to pay the compensation claimed under this subsection commits an offence and shall on conviction be liable to a fine not exceeding five hundred thousand shillings or to imprisonment for a term not exceeding one year or to both. 27. (1) A right to benefits in accordance with this Act shall lapse if the accident is not reported to the employer within twelve months after the date of such accident. Lapse of right to benefits. 19 Rev. 2010] Work Injury Benefits CAP have been wholly financially dependent upon the employee at the time of the accident, unless the contrary is proved. 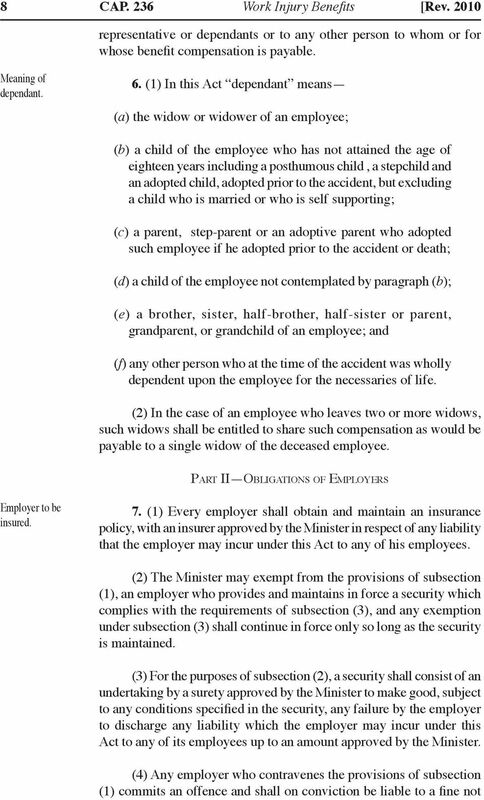 (4) In addition to the compensation payable under this section, the employer is liable to pay reasonable expenses for the funeral of the deceased employee subject to the maximum amount determined by the Minister, after consultation with the Council. 35. The Minister may, on the recommendation of the Director, and after consultation with the Board, amend the Third Schedule by notice in the Gazette in respect of the nature, extent, minimum and maximum amount of benefits Amendment of Third Schedule. Provided that at least sixty days before any such amendment a notice shall be published in the Gazette (a) of the intention to amend and the proposed content of the amendment; and (b) inviting any person who wishes to comment on the proposed amendment to submit such comment in writing to the Director within the period specified in the notice. 36. (1) Compensation payable in accordance with the provisions of this Act may, for reasons deemed by the Director to be sufficient, be Payment of compensation. 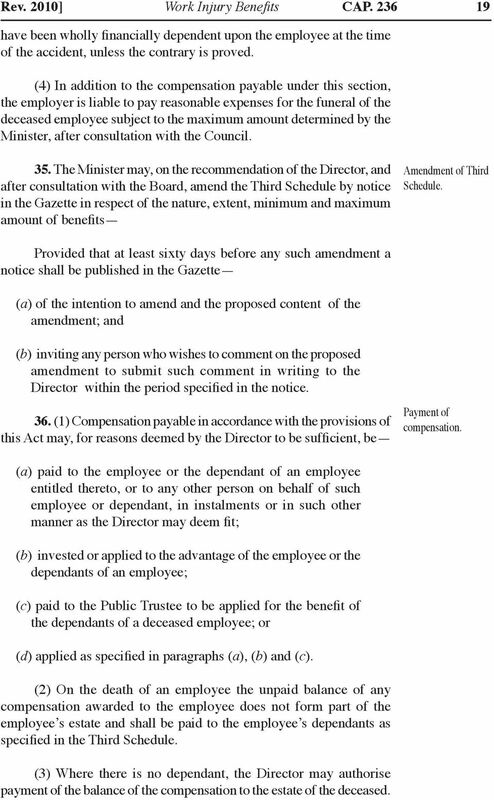 (a) paid to the employee or the dependant of an employee entitled thereto, or to any other person on behalf of such employee or dependant, in instalments or in such other manner as the Director may deem fit; (b) invested or applied to the advantage of the employee or the dependants of an employee; (c) paid to the Public Trustee to be applied for the benefit of the dependants of a deceased employee; or (d) applied as specified in paragraphs (a), (b) and (c). (2) On the death of an employee the unpaid balance of any compensation awarded to the employee does not form part of the employee s estate and shall be paid to the employee s dependants as specified in the Third Schedule. (3) Where there is no dependant, the Director may authorise payment of the balance of the compensation to the estate of the deceased. 20 20 CAP. 236 Work Injury Benefits [Rev Manner of calculating earnings. 37. 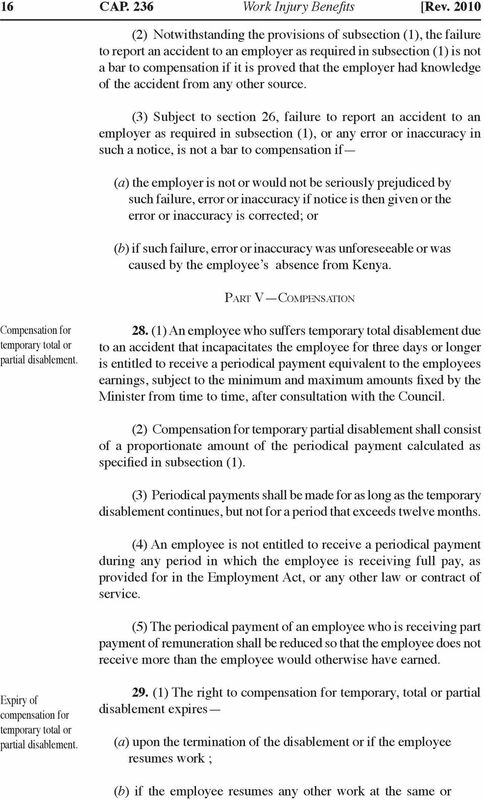 (1) In order to determine compensation, the earnings of an employee are deemed to be the monthly rate at which the employee was being remunerated by the employer at the time of the accident, including (a) the value of any rations, living quarters or both supplied by the employer to the employee to the date of the accident or report of disease; (b) allowances paid regularly; and (c) any overtime payment or other special remuneration of a regular nature or for work ordinarily performed; but excluding (i) payment for intermittent overtime; (ii) payment for non-recurrent occasional services; (iii) amounts paid by an employer to an employee to cover any special expenses; and (iv) ex-gratia payments whether by the employer or any other person. (2) If an employee s remuneration is not consistent or is determined in accordance with a rate calculated on the basis of work performed, the employee s earnings shall be calculated on the basis of average remuneration for similar work on the same conditions of remuneration for the period of twelve months prior to the accident. 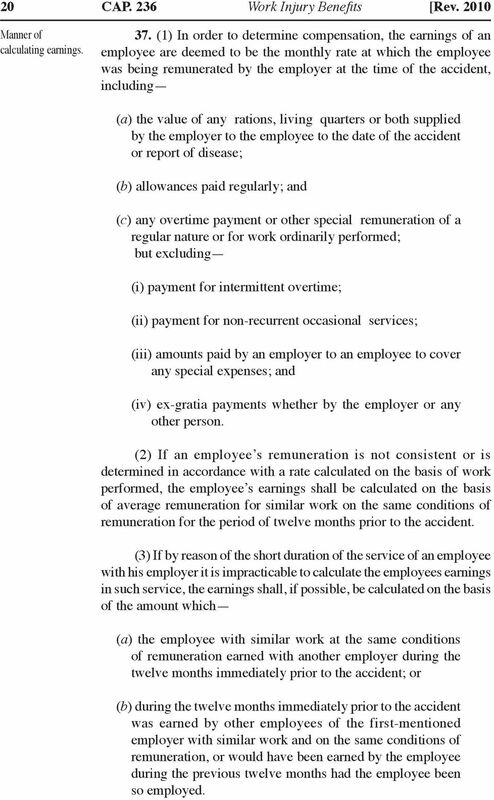 (3) If by reason of the short duration of the service of an employee with his employer it is impracticable to calculate the employees earnings in such service, the earnings shall, if possible, be calculated on the basis of the amount which (a) the employee with similar work at the same conditions of remuneration earned with another employer during the twelve months immediately prior to the accident; or (b) during the twelve months immediately prior to the accident was earned by other employees of the first-mentioned employer with similar work and on the same conditions of remuneration, or would have been earned by the employee during the previous twelve months had the employee been so employed. 21 Rev. 2010] Work Injury Benefits CAP (4) If an employee has entered into contracts of service with two or more employers and has in terms of those contracts, worked at one time for one employer and at another time for another employer, the employee s earnings shall be calculated as if the earnings under all such contracts were earnings in the employment of the employer for whom the employee was working at the time of the accident. 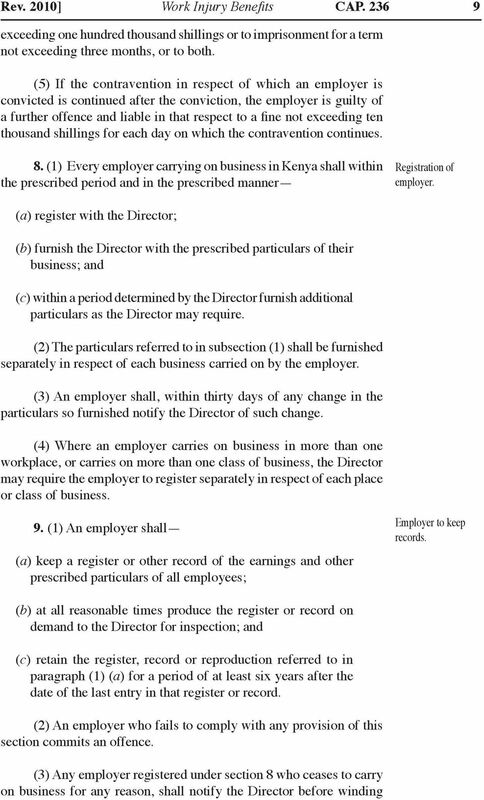 (5) If in the opinion of the Director it is not practicable to calculate the earnings of an employee in accordance with the subsections (2), (3) and (4), the Director may calculate those earnings in such manner as the Director may deem equitable, but with due regard to the principles laid down in those provisions. (6) This section shall not be construed as prohibiting the calculation of earnings on a weekly basis, but where earnings are so calculated the monthly earnings shall be calculated, as equal to four and one third times the amount of such weekly earnings. Part VI Occupational Diseases 38. 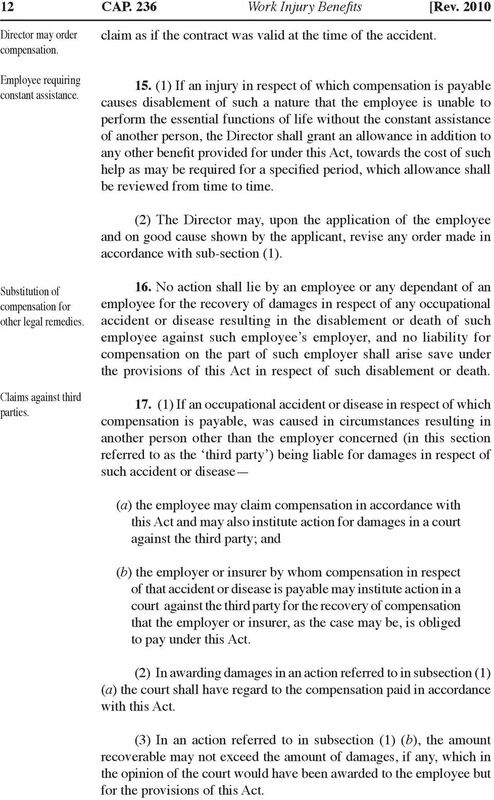 (1) Subject to the provisions of this Act,an employee is entitled to compensation in accordance with this Act, if the employee (a) contracts a disease specified in the Second Schedule that arose out of and in the course of the employee s employment; or Compensation in respect of scheduled and unscheduled diseases. (b) contracts any other disease that arose out of and in the course of the employee s employment. (2) An employee who contracts a disease in the circumstances contemplated in subsection (1) is deemed to have contracted an occupational disease and is entitled to compensation as if the disablement caused by the disease had been caused by an accident. (3) If an employee who has contracted an occupational disease has also contracted a disease other than an occupational disease and the recovery of the employee is being delayed or the employee s temporary total disablement is being prolonged by reason of that other disease, the employee is entitled to medical aid for that other disease. (4) If an employee has contracted an occupational disease resulting in permanent disablement and the disease is aggravated by another disease, a medical practitioner may, in determining the degree of permanent disablement have regard to that other disease if it is equitable to do so. 23 Rev. 2010] Work Injury Benefits CAP and in consultation with the Director, amend the Second Schedule by notice in the Gazette, in respect of the description of diseases and work: Second Schedule. Provided that at least sixty days before any such amendment a notice shall be published in the Gazette (a) of the intention to amend the Second Schedule and the proposed content of the amendment; and (b) in which any person who wishes to comment on the proposed amendment or amendments is invited to submit such comment in writing to the Director within the period specified in the notice. 44. (1) The Director may, after consultation with the Council and in consultation with the Director of Medical Services, appoint medical advisory panels which shall consist of such members as may be necessary to Appointment of medical advisory panels. (a) assist with regard to the diagnosis of occupational diseases in individual cases; (b) advise the Director regarding (i) the inclusion of occupational diseases in the Second Schedule; and (ii) general policy concerning the diagnosis of, and disablement as a result of, occupational diseases. (2) A member of a medical advisory panel shall be paid the prescribed remuneration, travelling and subsistence allowances out of the funds set aside for that purpose by Parliament. (3) The Director shall designate a member of a medical advisory Panel as chairman of the panel. (4) The members of a medical advisory panel shall hold office for such period and on such terms as the Director, after consultation with the Minister may determine. (5) The Director may, at any time after consultation with the Council, terminate the appointment of any member of a medical advisory panel who has been guilty of misconduct or neglect of duty, or is not able to perform his functions in accordance with the provisions of this Act. 24 24 CAP. 236 Work Injury Benefits [Rev Part VII Medical Aid First Aid. 45. (1) An employer shall provide and maintain such appliances and services for the rendering of first aid to his employees in case of any accident as may be prescribed in any other written law in respect of the trade or business in which the employer is engaged. 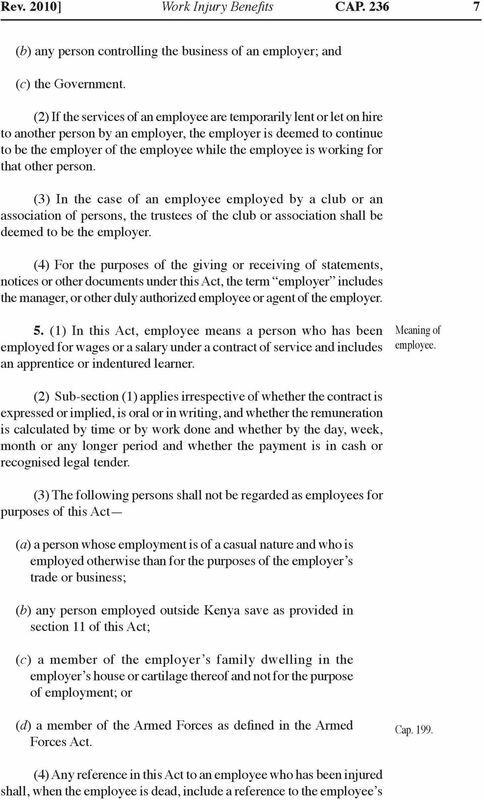 (2) Any employer who fails to comply with the provisions of subsection (1) commits an offence. (3) The Minister may, after consultation with the Council, by notice in the Gazette exempt an employer or class of employers from application of this section. Conveyance of injured worker. 46. (1) If an employee is injured in an accident, which necessitates the employee s conveyance to a hospital medical facility or from a hospital or medical facility to the employee s residence, the employer shall make the necessary conveyance available. (2) An employer or anyone in charge of the work in which the employee was employed at the time of the accident, who fails to comply with subsection (1) commits an offence. Medical expenses. 47. (1) Subject to the provisions of this section, an employer shall defray any expenses reasonably incurred by an employee as the result of an accident arising out of, and in the course of the employers employment in respect of the following matters (a) dental, medical, surgical or hospital treatment; (b) skilled nursing services; (c) the supply of medicine and surgical dressing; (d) travelling and subsistence in connection with the employee s journey to and treatment in a place within Kenya where he was directed by his medical practitioner to go for treatment; and (e) the supply, maintenance, repair and replacement of artificial limbs, crutches, and other appliances and apparatus used by persons who are physically disabled. (2) For the purposes of subsection (1), any damage to any appliance or apparatus specified in paragraph (1) (e) is deemed to be an injury. 25 Rev. 2010] Work Injury Benefits CAP (3) The necessity, nature and sufficiency of any medical aid provided or to be provided in accordance with the provisions of this Part shall be determined by the Council. 48. (1) A medical practitioner who examines an employee shall within fourteen days after the first examination of the employee injured in an accident or within fourteen days after having diagnosed an occupational disease, furnish a medical report to the Director in the prescribed manner. Submission of medical report. (2) Where the employee has at the time of the diagnosis of an occupational disease left employment, the medical report shall be made to the Director in a separate form as prescribed under this Act. 49. 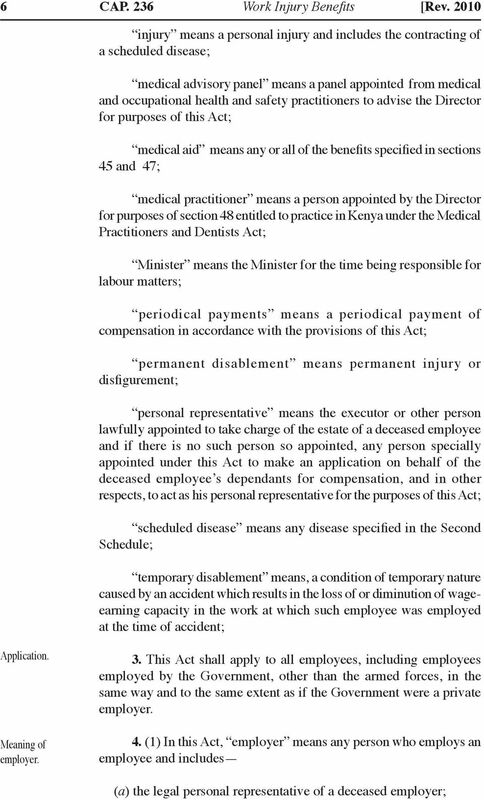 The fees and charges for medical aid to a employee shall be in accordance with the scale prescribed by the Minister, from time to time, after consultation with the Council and such bodies or associations representing medical practitioners entitled to practice within Kenya as the Minister may think fit, and no claim for an amount in excess of a fee in accordance with that scale shall lie against any employer in respect of any such medical aid. 50. (1) An employer who demands, receives, deducts or recovers from an employee a contribution towards the cost of medical aid supplied or to be supplied in accordance with the provisions of this Act, commits an offence. Fees for medical aid to be prescribed. Contributions by employees towards cost of medical aid prohibited. (2) If an employer has been convicted of contravening subsection (1), the Director may in the prescribed form, issue an order against that employer for the payment of the amount received contrary to the provisions of subsection (1). Part VIII Appeals 51. (1) Any person aggrieved by a decision of the Director on any matter under this Act, may within sixty days of such decision, lodge an objection with the Director an objection against such decision. Objections and appeals against decisions of the Director. (2) The objection shall be in writing in the prescribed form accompanied by particulars containing a concise statement of the circumstances in which the objection is made and the relief or order which the objector claims, or the question which he desires to have determined. 52. (1) The Director shall within fourteen days after the receipt of an objection in the prescribed form, give a written answer to the objection, varying or upholding his decision and giving reasons for the decision objected to, and shall within the same period send a copy Director s reply. 27 Rev. 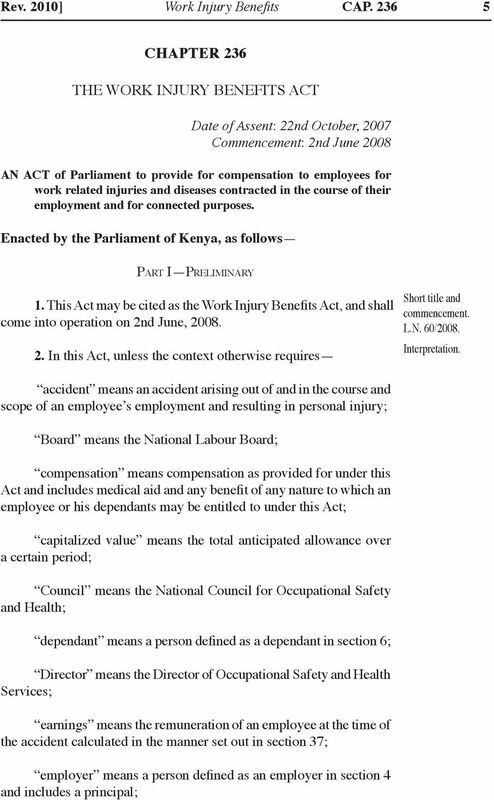 2010] Work Injury Benefits CAP (b) prescribing anything which is to be or may be prescribed under this Act; and (c) requiring employers and insurers carrying on in Kenya the business of insuring employers against their liabilities under this Act to make periodic or other returns as to such matters as the Minister may think fit, and prescribing a time limit for the making of such returns. (2) Any person required to make a return by virtue of any regulation made under subsection (1) who (a) fails to make such return within the time specified; (b) makes or causes to be made a return which the person knows to be false in any material particular; or (c) on being so required fails to give any information or explanation respecting the return which it is in the person powers to give, commits an offence and shall, on conviction be liable to a fine not exceeding fifty thousand shillings, and, if the contravention in respect of which the person is convicted is continued after the conviction, he shall be guilty of a further offence and liable in respect thereof to a fine not exceeding ten thousand shillings for each day on which the contravention is so continued. (3) Where a person convicted of an offence under this section is a company, the chairman, every director and every officer of the company shall be guilty of a like offence unless that persons proves that the act or omission constituting the offence took place without the person s knowledge or consent. 57. The Workman s Compensation Act is repealed. 58. (1) Any regulation or other instrument made or issued under the Workmen s Compensation Act and having effect before the commencement of this Act shall continue to have effect as if such regulation or other instrument were made or issued under this Act. Repeal of Cap Savings. 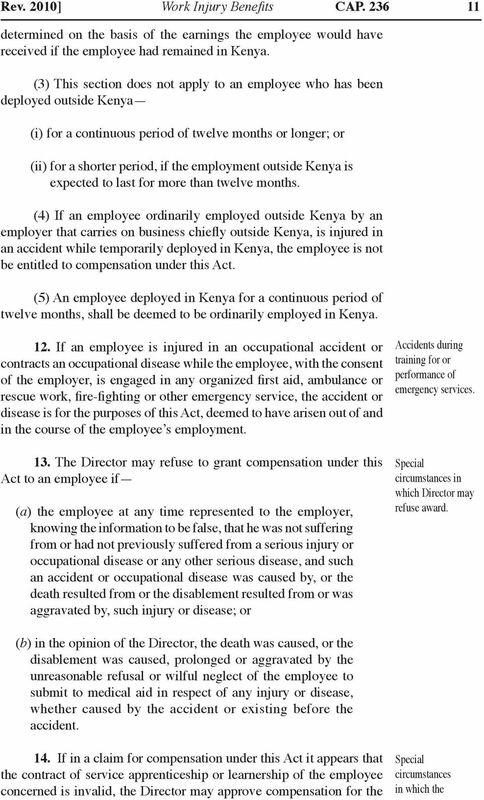 (2) Any claim in respect of an accident or disease occurring before the commencement of this Act shall be deemed to have been lodged under this Act. WORKMEN S COMPENSATION ACT CHAPTER 88:05 Act 24 of 1960 Amended by 12 of 1962 29 of 1968 46 of 1979 17 of 1981 18 of 1986 36 of 1997 Current Authorised Pages Pages Authorised (inclusive) by L.R.O. 1 110.. THE UNITED REPUBLIC OF TANZANIA THE MOTOR VEHICLES (TAX ON REGISTRATION AND TRANSFER) ACT CHAPTER 124 REVISED EDITION 2006 This edition of the Motor Vehicles (Tax on Registration and Transfer) Act, Cap.